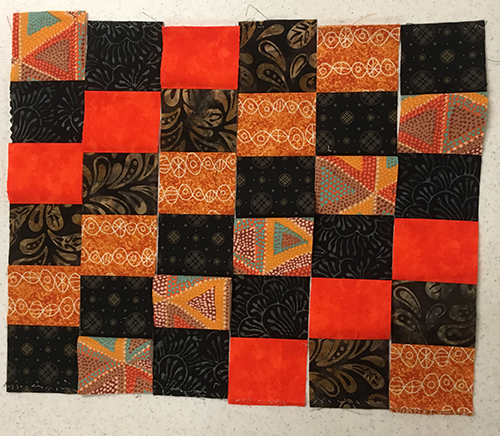 By the time I finish piecing a quilt’s center, I’m ready to be done. In the past, sometimes I’ve attached plain ol’ borders and called it quits. But when I’ve given more thought and effort to a border, it has paid off. Scarlet Spin is a good example. 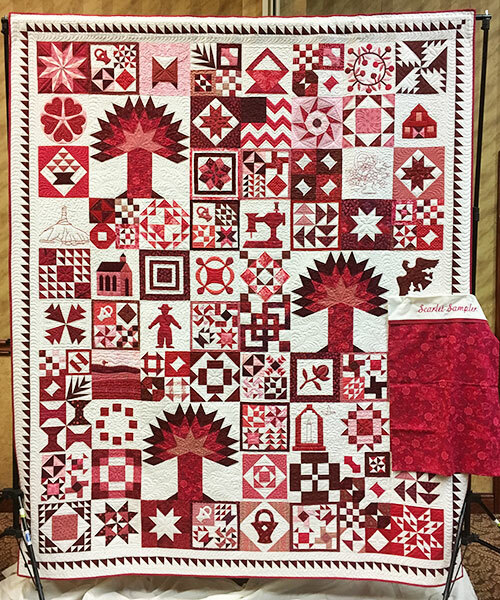 Scarlet Spin by Diane Harris. Photo by Mellisa Karlin Mahoney. Used with permission. I’ve learned not to rush to the finish line, but to take time to do the border justice. 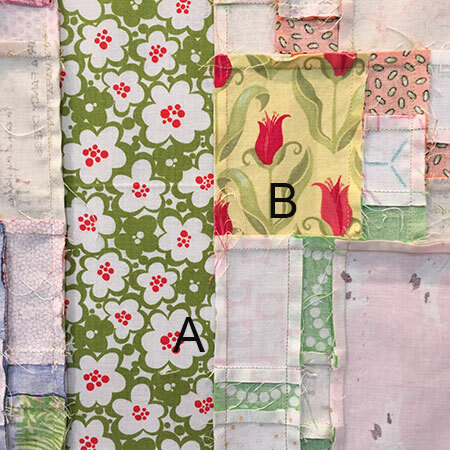 Bonnie Hunter influenced me with her borders, which can be as involved as the quilt center. I don’t think she has ever slapped on a plain border and called it good. 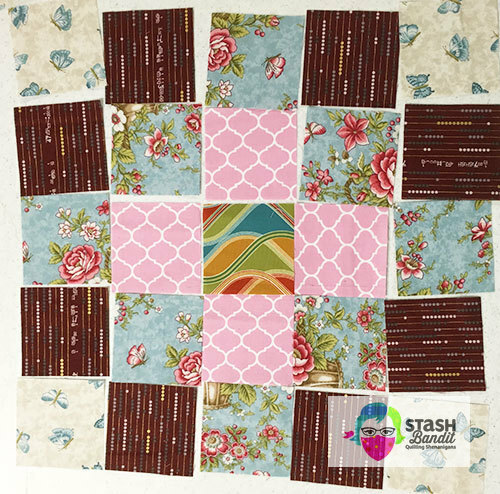 I have a new easy quilt design in McCall’s Quick Quilts! You can make it look like Christmas, or you can choose different colors for any time of year. It’s called Very Merry, and it was fun, fast and simple to make. You’ll find it in their Oct/Nov issue, available in paper or digital versions. I’ve been inspired by some over-the-top quilts recently and I’d like to share them with you. My local guild met this week and the show-and-tell lasted for an hour. I asked for permission to show you some of the quilts my friends made. 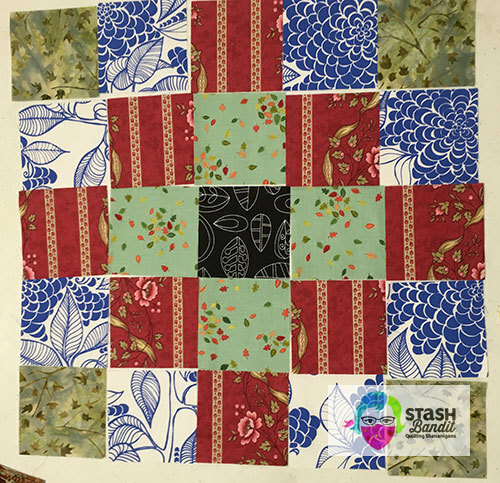 Carol started this Four Patch/work quilt during the Olympics when Temecula Quilt Co. offered the pattern for free. 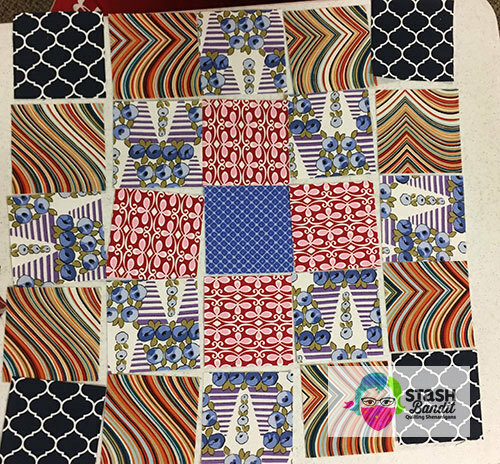 This quilt was made by Carol, who started it during the Olympics when Temecula Quilt Co. offered the pattern as a freebie. 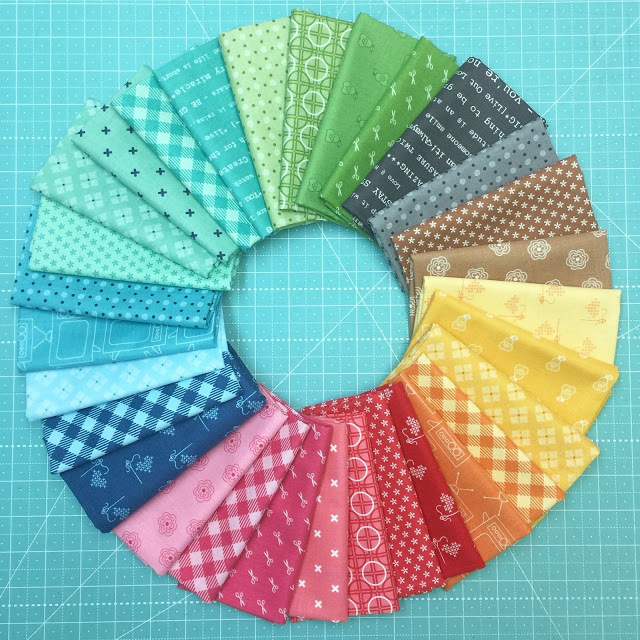 I’m a big fan of Fat Quarter Shop for their great fabric selection and fast shipping. 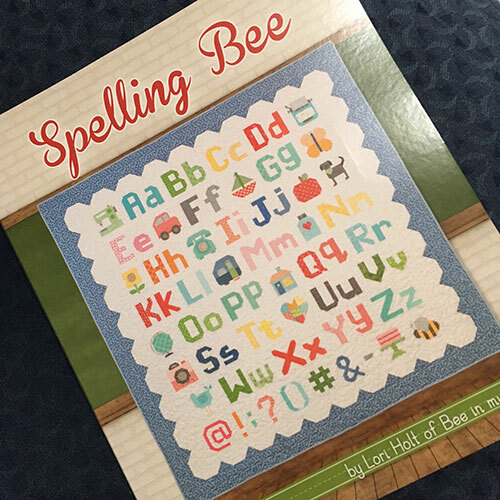 Their publishing arm is called Just Sew Emma, and they recently sent me a review copy of Lori Holt’s new book, Spelling Bee. If you’re not familiar with Lori Holt, I’d like to introduce you. 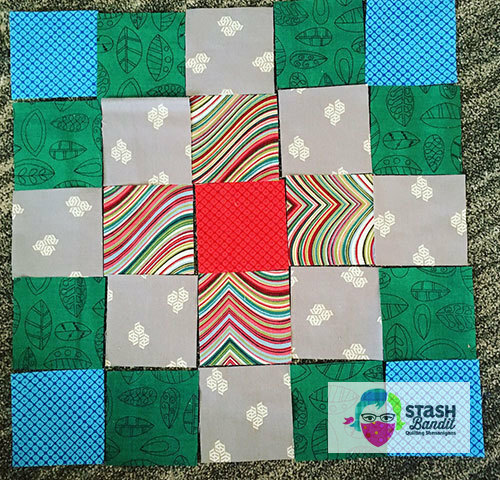 She is the creator behind Bee in My Bonnet, a blog where she shares her quilt-related ideas along with thoughts on family and faith. 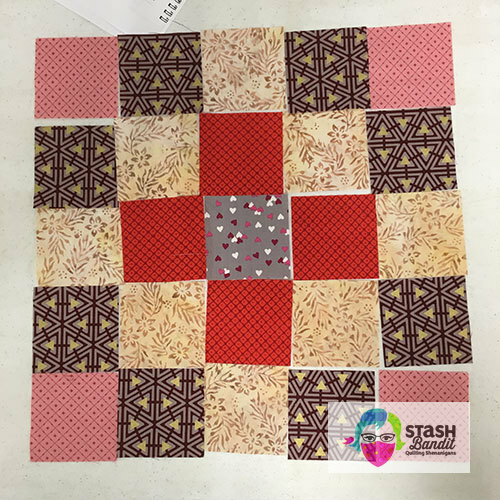 She often hosts sew-along events where you can enjoy making progress on one of her quilt designs along with other quilters. 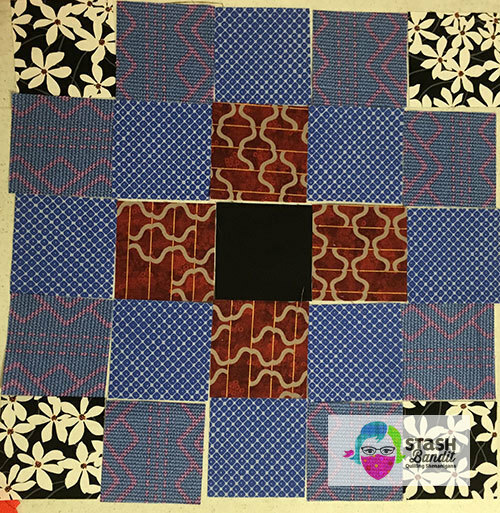 If you’re not in a local quilt group, this is a good place to become part of an online quilt community and make some new friends from across the country and around the world. Lori designs fabric for Riley Blake Designs. Aren’t the colors nice? I think of them as fresh, happy, vintage hues. 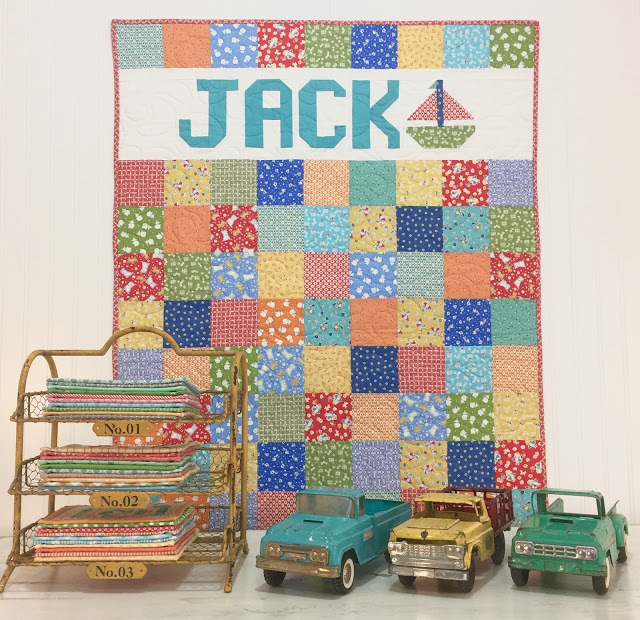 They’re at many local quilt shops and online at Fat Quarter Shop. 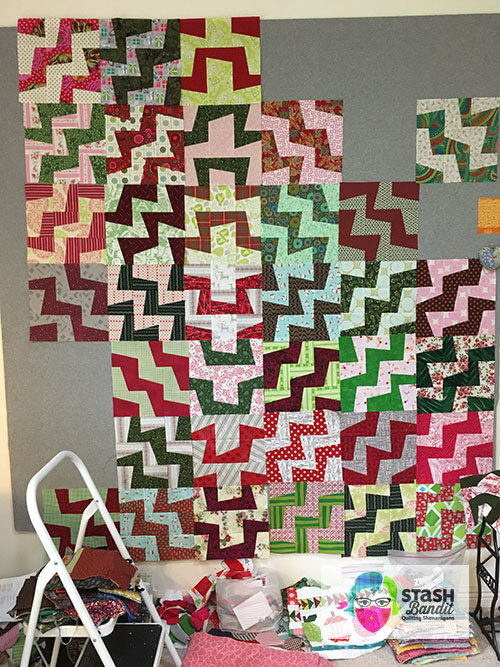 You may have heard of Lori’s Farm Girl Vintage book, which has spawned hundreds of interesting quilts by happy sewists the world over. I’m happy to say that Spelling Bee is chock-full of the user-friendly patterns that Lori is known for. There is a complete pieced alphabet in both upper and lower case. I gave the capital D a go and it went together without a hitch in just a few minutes. There are also numerals and even punctuation. You can spell out anything you want, or use some of the ideas Lori presents. And there are many! 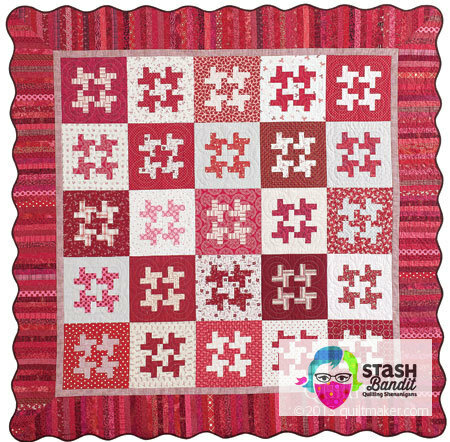 “Sew” with a pink machine may be one of my favorites. 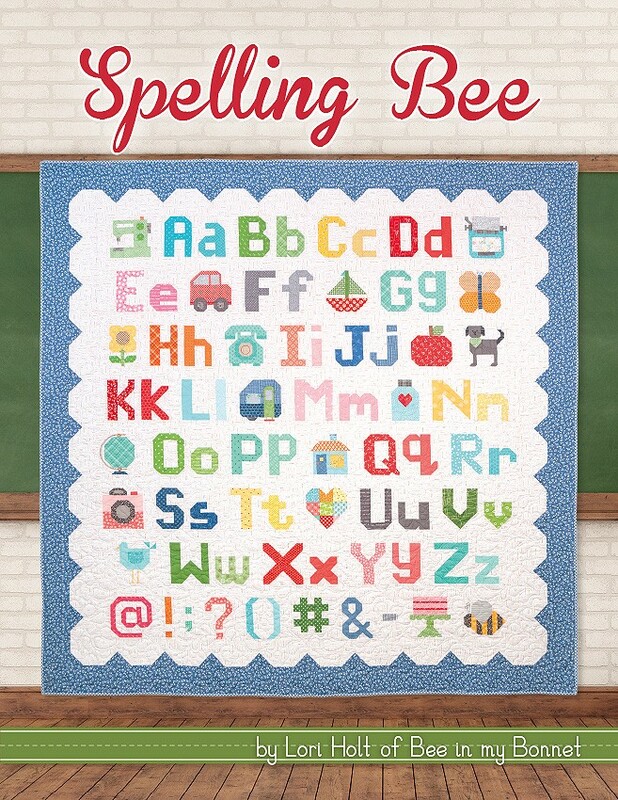 And yes, the machine pattern is in Spelling Bee, too! 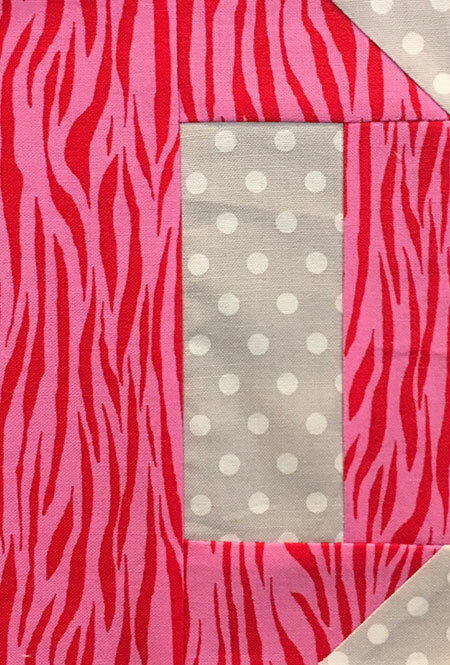 Is this not the cutest easy baby quilt pattern? You can personalize it for your recipient! You can switch out the sailboat for another block if you like, as there are many to choose from. 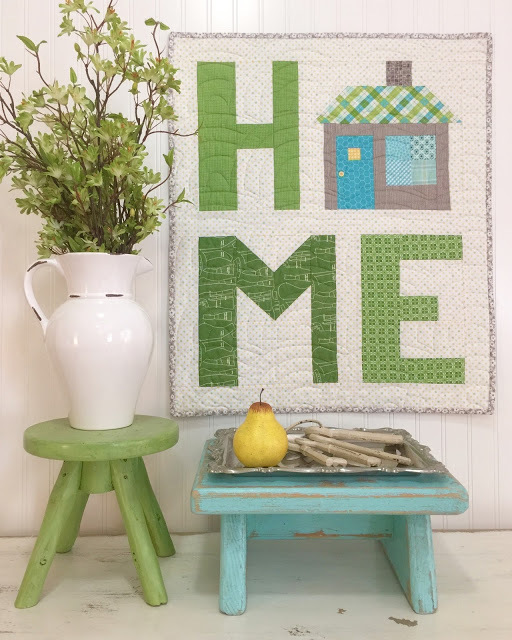 I really love “Home.” Here’s another cool thing: As in many of Lori’s books, the blocks are presented in 6″ and 12″ sizes, which further expands the possibilities. The book retails for $34.95 which may be a little more than you’re used to spending on a quilt book, but with nearly 200 pages of patterns and fresh ideas, it is worth every penny. You’ll use it over and over, and you’ll have a great time in the process. 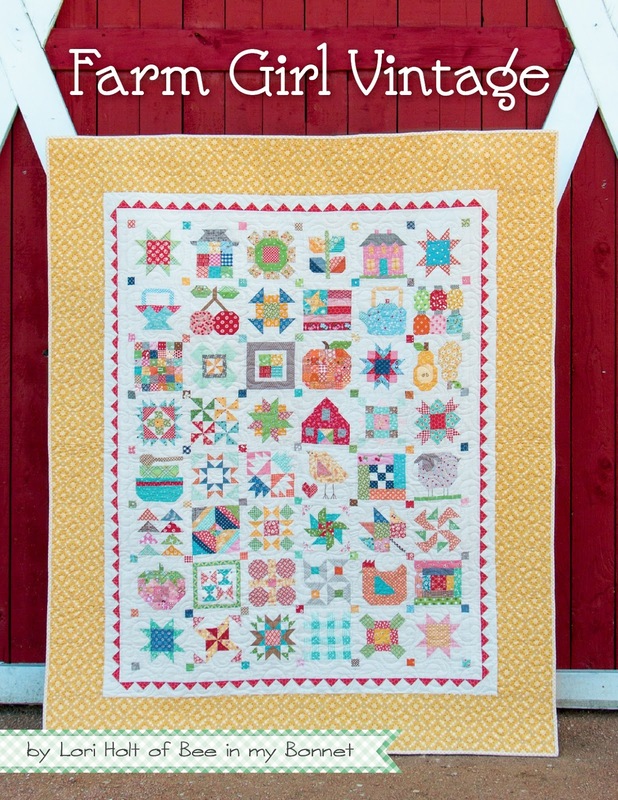 Farm Girl Vintage 6″ quilt blocks made by Paula Stoddard. Used with permission. 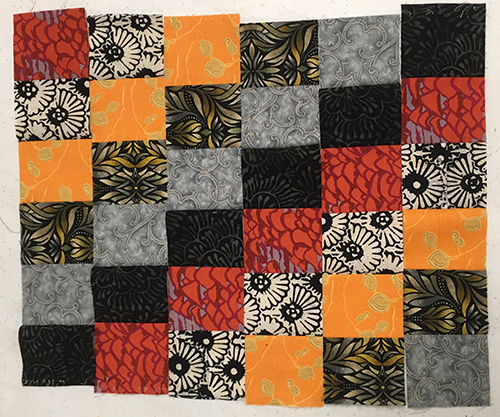 My friend and former Managing Editor of Quiltmaker/McCall’s Quilting/Quick Quilts Paula Stoddard made these Lori Holt blocks at a retreat last winter, above. They finish at 6″ and they are over-the-top adorable. They’re from the Farm Girl Vintage book. 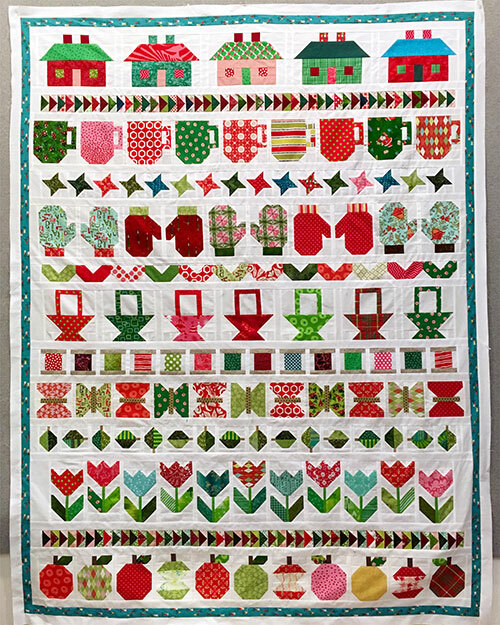 This is my Christmas version of another Lori Holt quilt from her book called Quilty Fun. 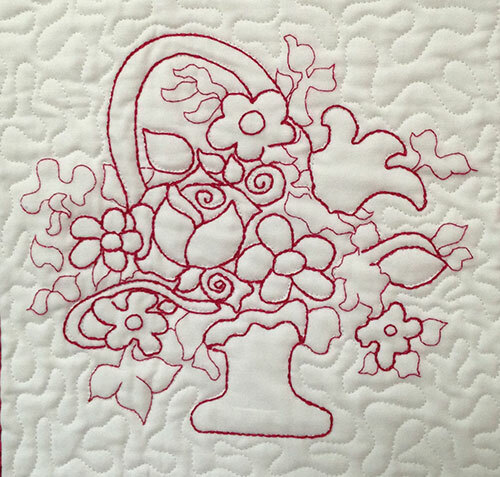 I made it when the patterns were presented free online, one at a time, several years back. I have just the outside borders to add and then I can quilt it. You can see that Lori is a talented designer. I’d recommend you pick up one or more of her books today. They’re great for scrap quilts, and the more fabrics you use, the better! 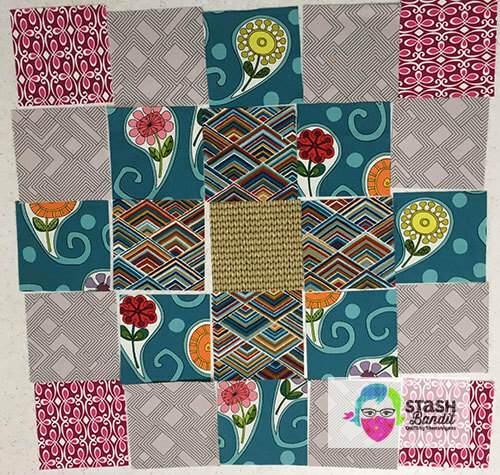 A note from Diane at Stash Bandit: I am not affiliated with Lori Holt or Fat Quarter Shop and I do not receive compensation for my honest reviews or posted links. I receive review copies of new books from It’s Sew Emma. 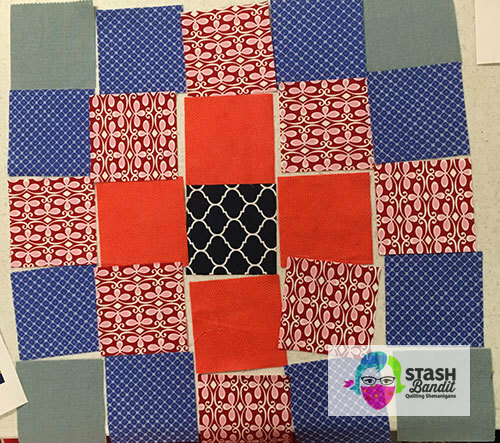 Quilt Fatigue: Have You Had It? 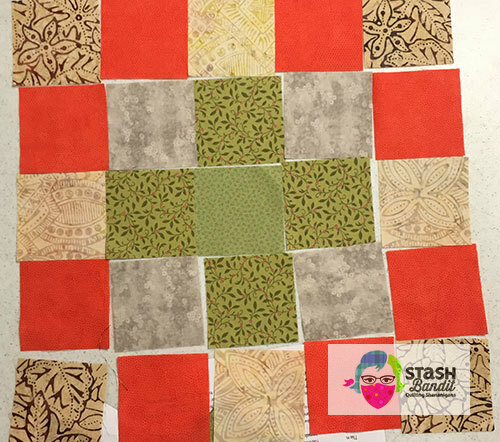 I have quilt fatigue over my current project, and I’m betting you’ve had it, too. 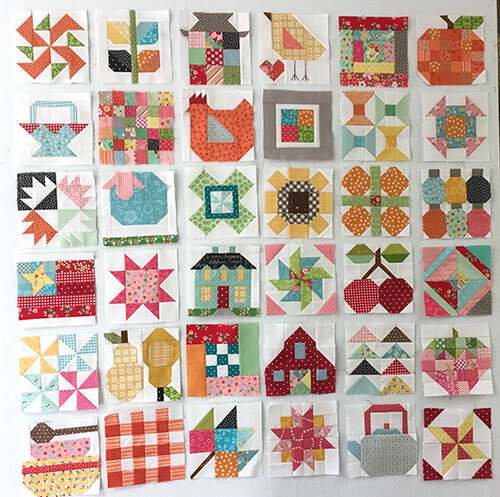 Here’s how it goes—you’ve pieced 30 or 40 quilt blocks from your favorite fabrics. 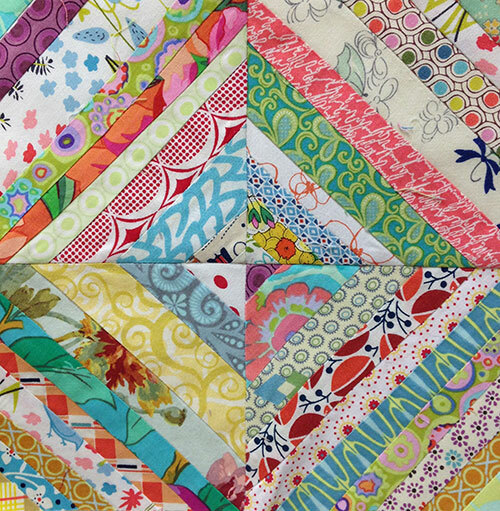 You’ve enjoyed the heck out of making this patchwork. But you have many more blocks to go, and somehow your attention begins, inexplicably, to drift. My current project: Fractured by Kathy Doughty from the book Making Quilts with Kathy Doughty, ctpub.com. It’s not the project’s fault. In fact, I love my current endeavor. 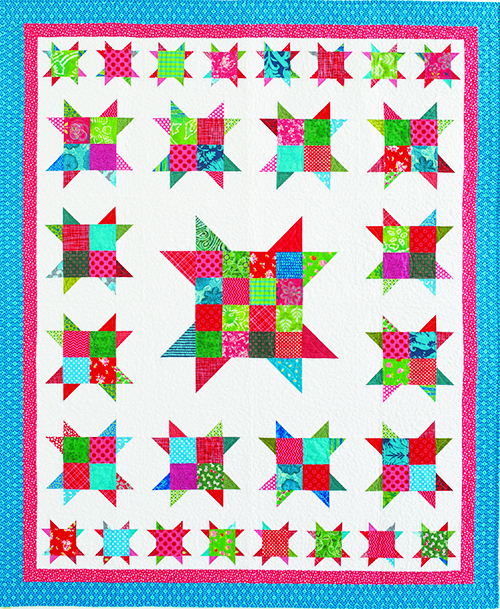 It’s Kathy Doughty’s Fractured design from the Making Quilts book. It’s amazing! 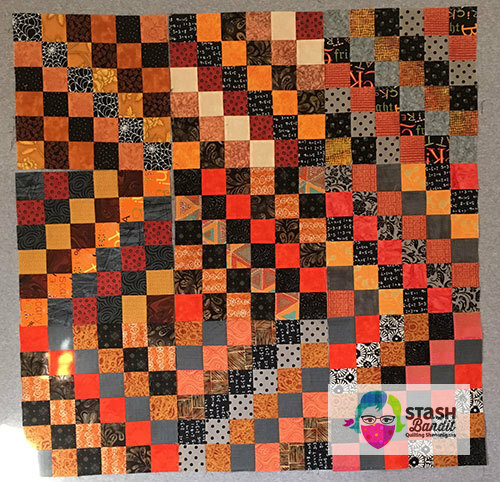 It goes together quickly and easily, it’s perfect as a scrap quilt, and it makes for a real “wow” factor. What’s not to adore? Nevertheless, because I got restless, because I have quilt fatigue, I found an empty space on the studio floor and started this little gem. I’m having so much fun with it! It’s going to be my next free pattern. It’s been done many times before but not with these exact fabrics or with my exact fabric sensibilities. It always feels good to make something uniquely my own. 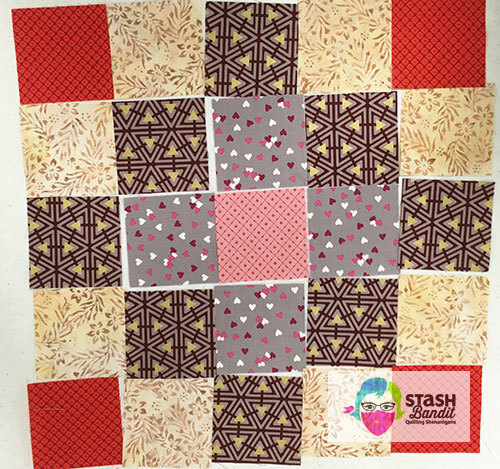 This will become my next free pattern, although truly you don’t need a pattern—it’s just half-square triangles. 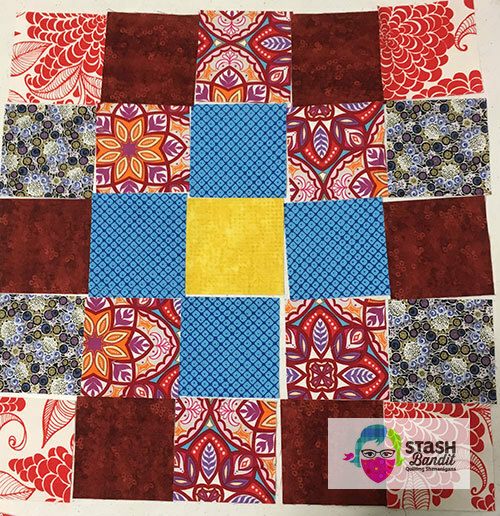 If you’re just getting started in quilting, maybe you’ll enjoy having instructions, and if you want to use your stash, I’ll talk specifically about combining fabrics in ways that work. Right now I’m trying to decide if I can work in some navy. I definitely want it to say “Christmas,” and if I stray too far from the recipe, that message could get lost. Stay tuned. 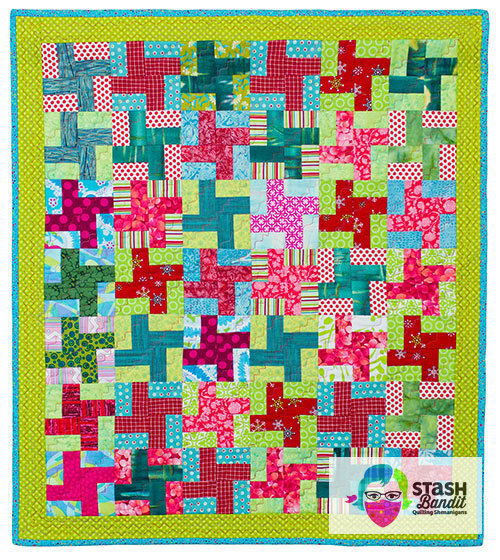 All the quilts in this post will become part of my “Jingle Bells” trunk show for quilt guilds. 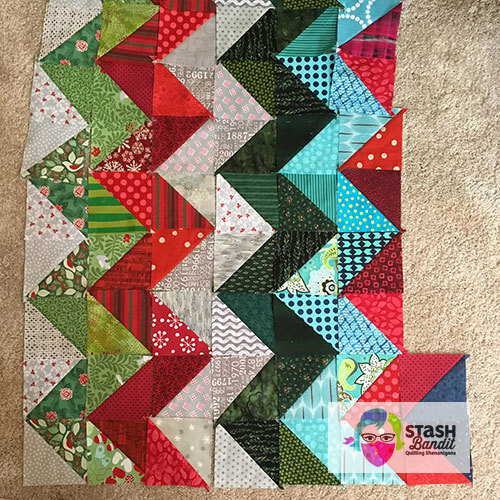 It’s so much fun to share holiday quilts and get people excited to sew for Christmas well ahead of time. Call and book your program today! 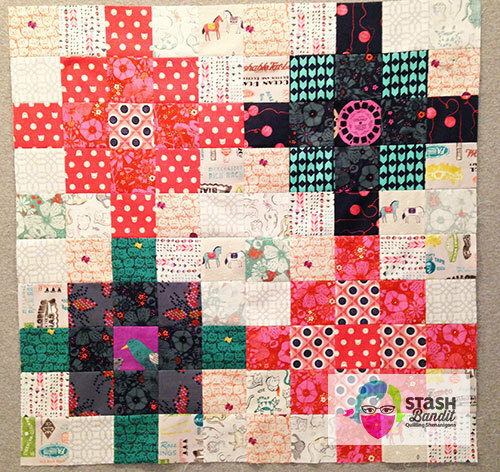 So how do you work through quilt fatigue? I’m afraid this happens to me often, which I why I have a lot of UFOs. When I hear someone say they have zero unfinished projects, I’m astounded. How do you even do that?! Maybe you can give the rest of us some guidance in the comments. I’d love to hear from you! 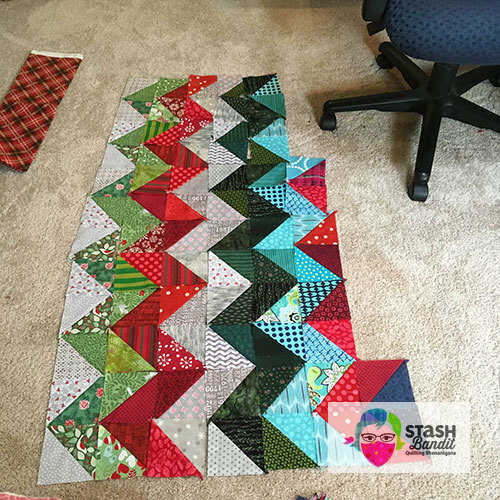 Check out the current free pattern for a small scrap quilt called Christmas Dance that finishes at 27″ x 31″. Christmas Dance by Diane Harris. Photo: Kristen Laing Photography. About two years ago, I began an interesting journey. Now the trip is almost over and I’m feeling a variety of emotions. 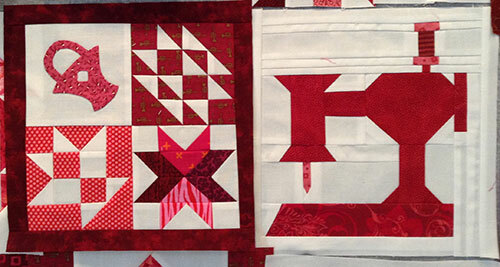 Let me tell you about a quilt called Scarlet Sampler. Late in the summer of 2015, the president-elect of Nebraska State Quilt Guild asked if I’d be interesting in helping out with the guild’s raffle quilt for 2017. 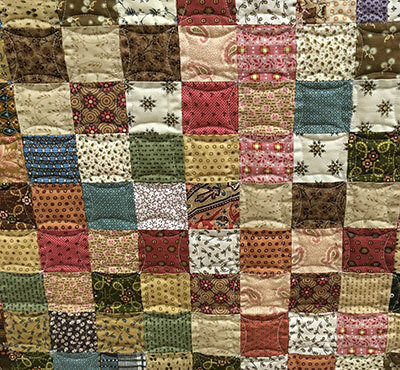 The raffle quilt is a major fund raising tool for NSQG, and they usually sell all 4999 tickets, which is the maximum number allowed by Nebraska’s gaming laws. “Helping out” didn’t sound too hard, so I said yes. Somehow it turned out differently than that. I was the only person on the committee of four with quilt design experience. Two members were beginners. I kind of fell into the whole thing. 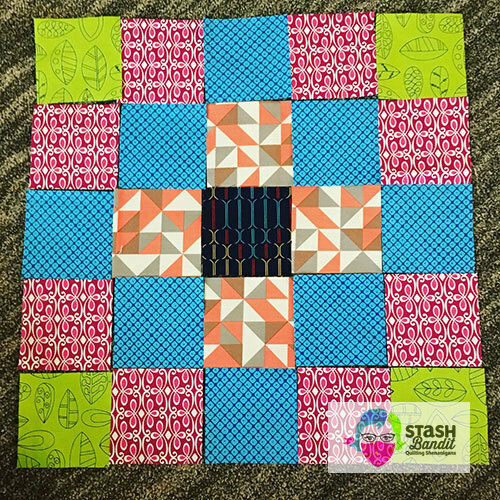 We decided early that we wanted to do a sampler quilt—even though I don’t usually like sampler quilts. In this case, it seemed the only way to pay tribute to Nebraska’s history and heritage. Our state celebrates her 150th birthday this year, and we wanted to honor her in a big way. 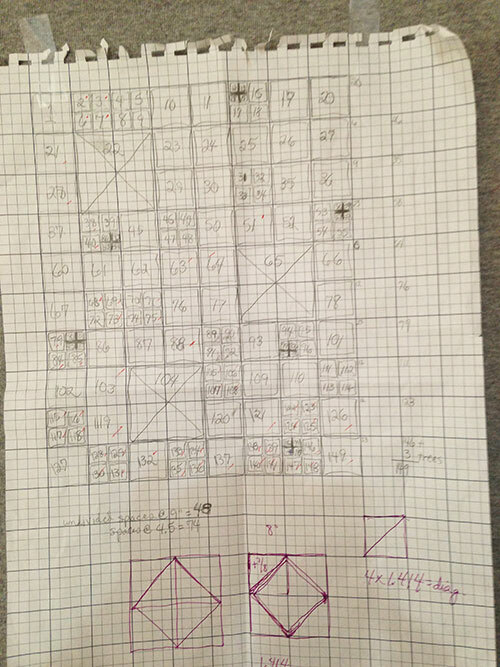 I worked the block layout over and over on graph paper until it seemed right, with 149 quilt blocks in many sizes. We chose blocks we liked that also had Nebraska ties in some way. 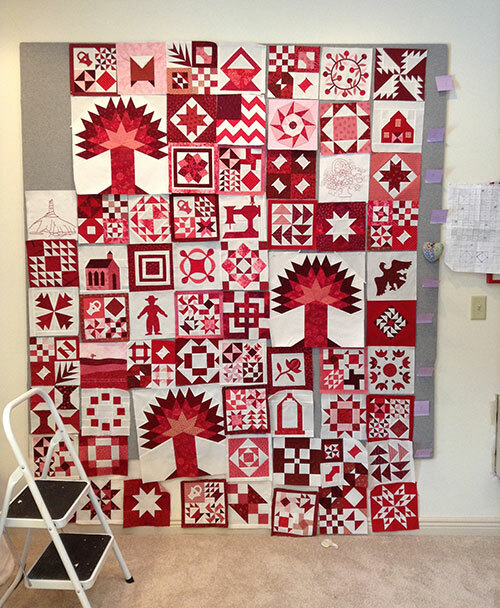 We started making them with fabrics from my stash of reds, and I worked and reworked a diagram for an idea I had: put 149 blocks on the quilt front, and one giant Nebraska Windmill block on the back to equal 150. There were many times when I wasn’t sure it would work. I wondered if it would be hideous. I worried that nobody would buy the tickets. I fretted over our deadline. 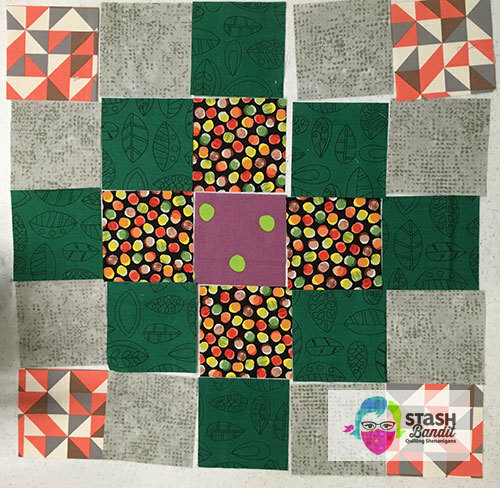 I agonized over putting a design out for public scrutiny, indeed more than that: asking people to spend hard-earned cash for a slim chance of winning the quilt. I stewed and hoped and prayed. It was difficult to keep track of so many blocks. I made a spreadsheet but felt hopelessly lost most of the time. How many blocks were done? Which ones? What were their sizes? What was left to complete? Was it balanced? Did the reds work together? 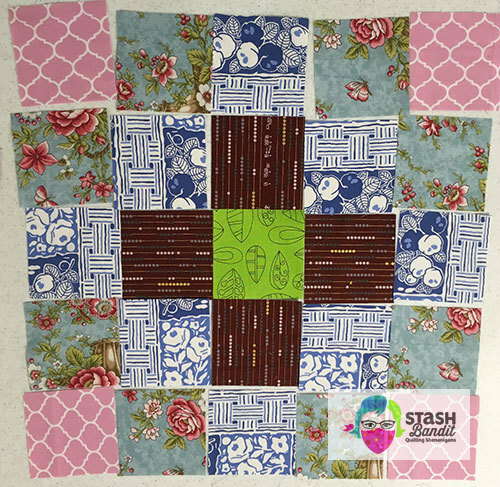 Would the pieced border actually fit? Finally we were close enough to start putting them on my design wall. A ray of hope: maybe it would work. 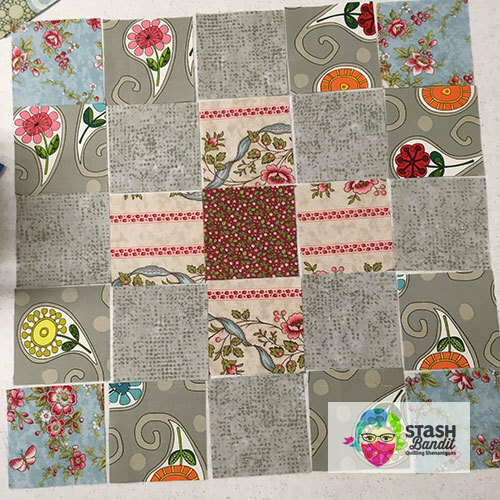 We sent it off to Kris Vierra from Lincoln, an award-winning longarm quilter. 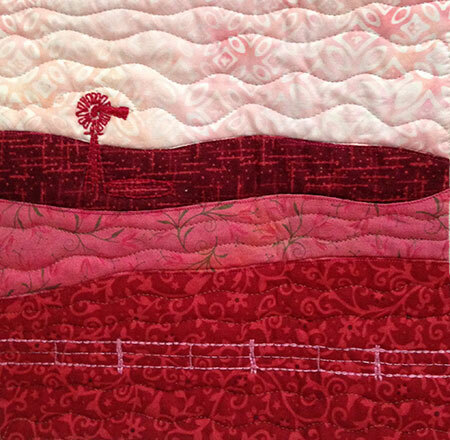 This was one time I felt confident, as I knew Kris’s work was exquisite and could bring the quilt to life. When it came back, I was so happy with the job Kris had done. The quilting looked fabulous. 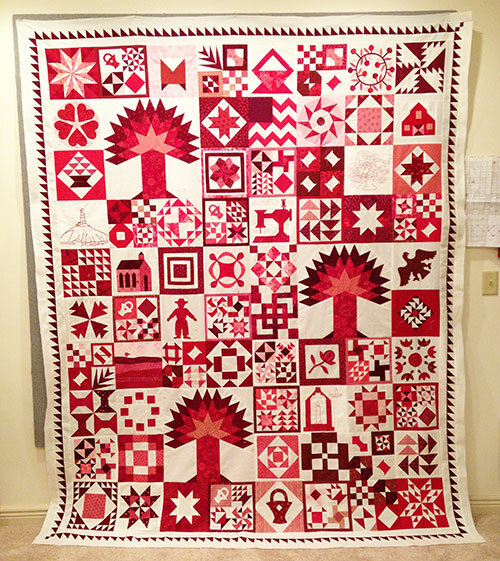 I should add here that the quilt back needed to be centered because of the large Nebraska Windmill block. Kris did an excellent job of that, too. On went the label and the binding. Tickets were printed, and we were ready to go. 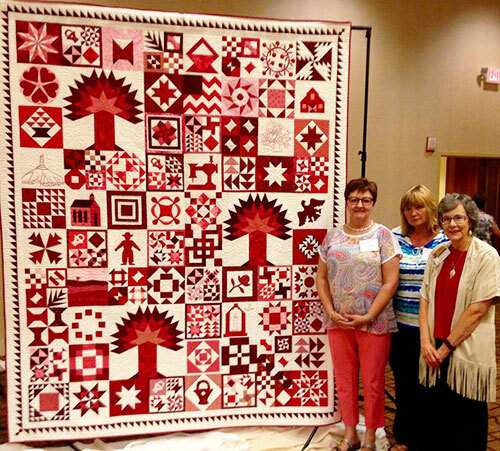 The quilt was unveiled at QuiltNebraska 2016, on July 30, 2016 to a standing ovation. It felt like the weight of the world was lifted from my shoulders at that moment. They liked it! 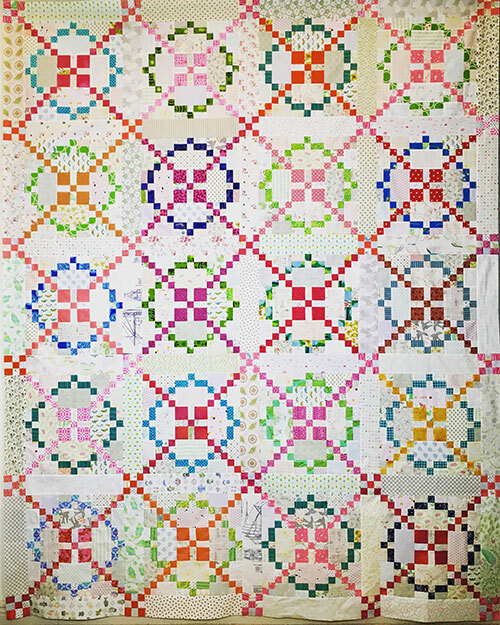 The quilt went on to be recognized with a first place ribbon at Nebraska State Fair, the largest state fair quilt show in the nation with more than 600 entries. We were very pleased. And then something amazing happened. The big night came, we sold the last of the tickets, more people said they wanted to win the quilt. 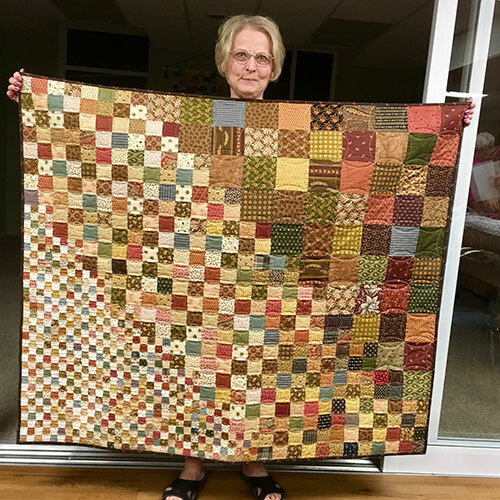 And when the winner was pulled from the huge basket of stubs, it turned out that she’s a quilter, from Nebraska, and listen to this: Her husband had died the day before. It’s just a quilt. It’s not a loved one. It’s a special quilt, and it’s going to someone who will understand that. It’s going to her at a dark and heavy time of loss, and maybe it will bring a bit of joy in the days to come. 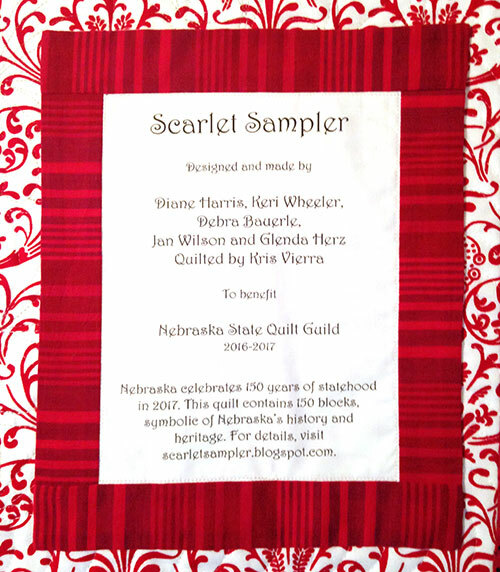 It was my privilege to be part of this, and it will be my privilege to deliver Scarlet Sampler to its new owner one day soon. There was agony, there was ecstasy, and I learned a whole lot in the process. I call that a success. 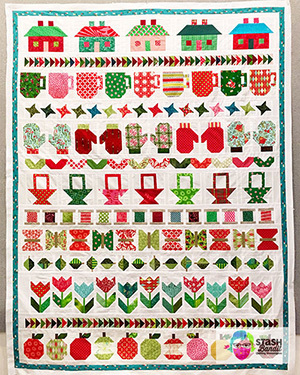 You can read more about Scarlet Sampler, the significance of the blocks to Nebraska and other details at scarletsampler.blogspot.com. 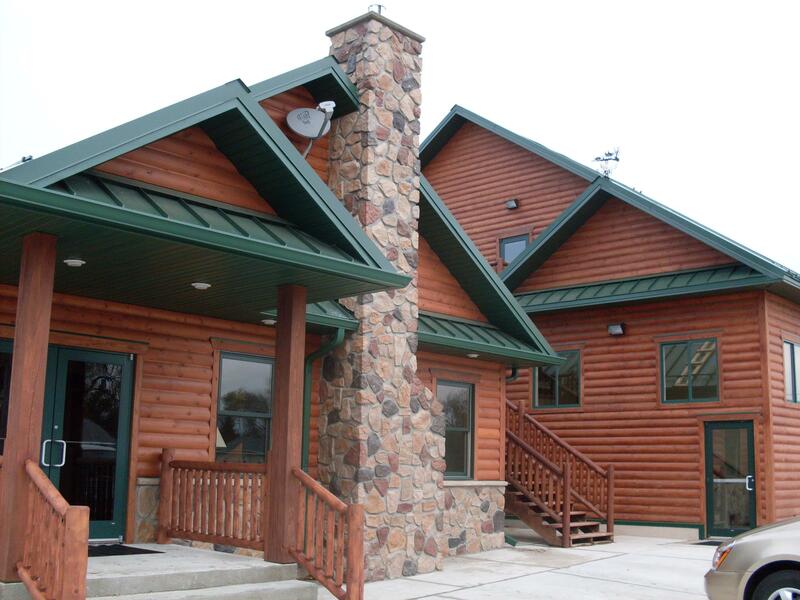 You’re invited to join us for two and a half days of fun and relaxation at the beautiful lodge owned and operated by Hunt Nebraska in Arapahoe, Nebraska, Sept. 24 to 27, 2017. It’s a lovely space—clean and comfortable, and you can just relax and sew to your heart’s content. We’ll cook and clean up while you create! 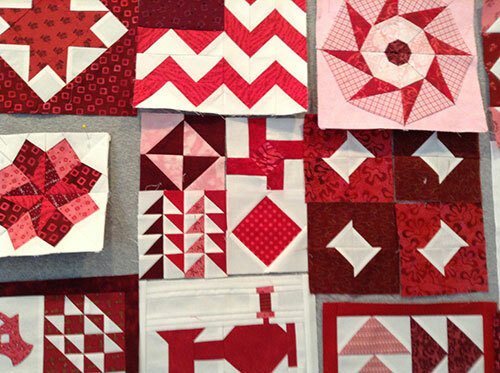 Arrive on Sunday evening at 7 pm for wine and cheese and an introduction to string piecing. 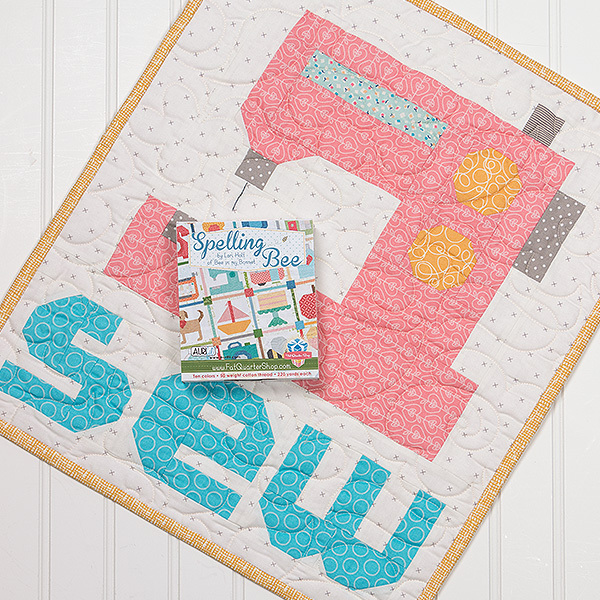 Settle into your room and your quilting space, and meet your new friends. Then start sewing, or retire early to be well rested for Monday’s activities. 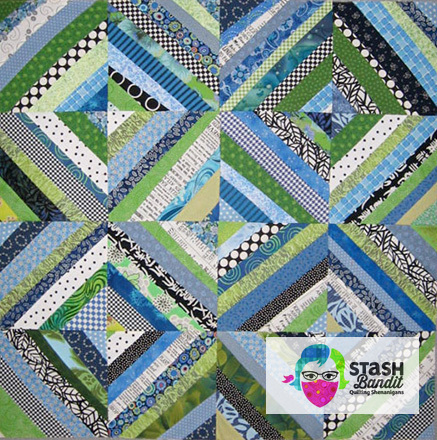 Spend Monday and Tuesday learning about string piecing and all its possibilities. Sew, sew, sew! We’ll take stretch breaks as needed and step outside to enjoy the beautiful autumn weather, maybe even go for a short walk. 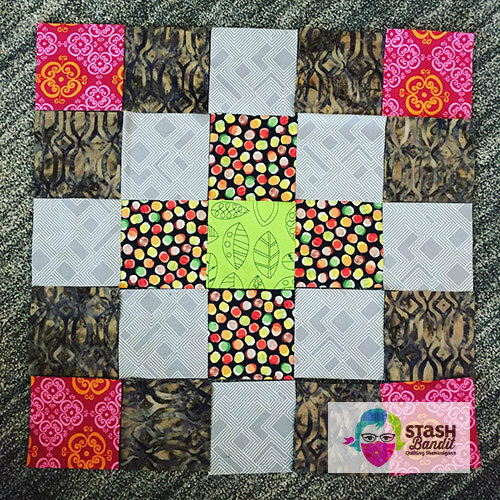 What can you do with string piecing? 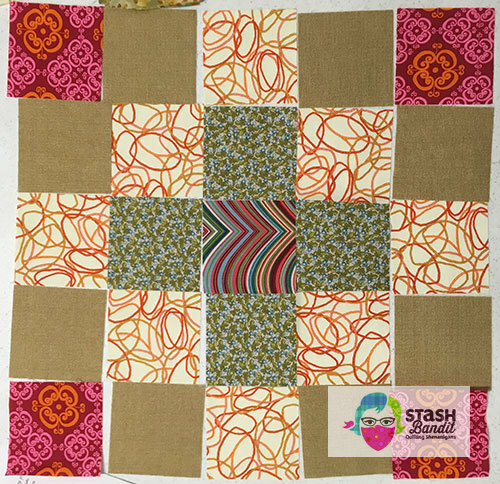 This is one very simple, very easy block you can make. Your own fabrics will make your blocks unique. We’ll trade fabrics with each other but the best part? 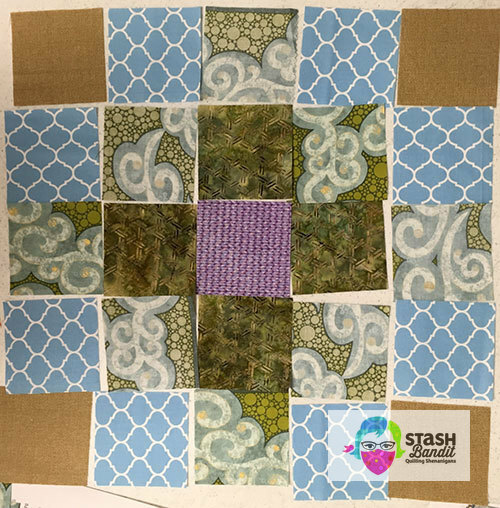 I’m bringing a huge assortment of scraps and leftovers for you to use, too! You get to sew from my stash of saved-up treasures! 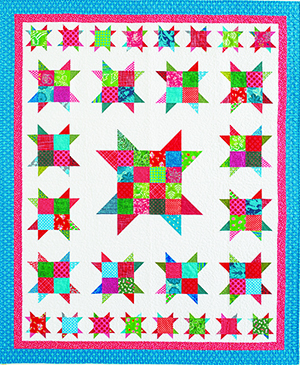 This Ohio Star was spiced up with string piecing. 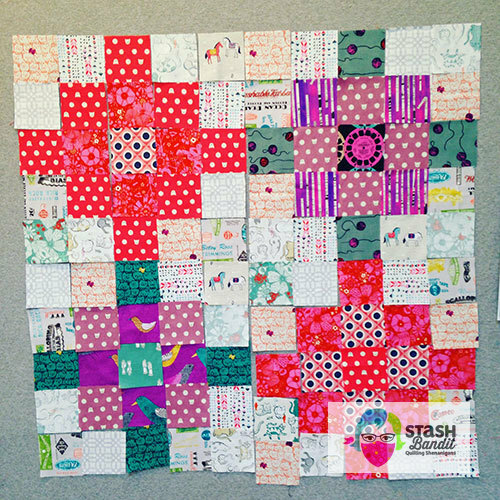 Every patch is “fabric” that was created with strips of leftovers. It’s more interesting than it would be if the patches were just prints. 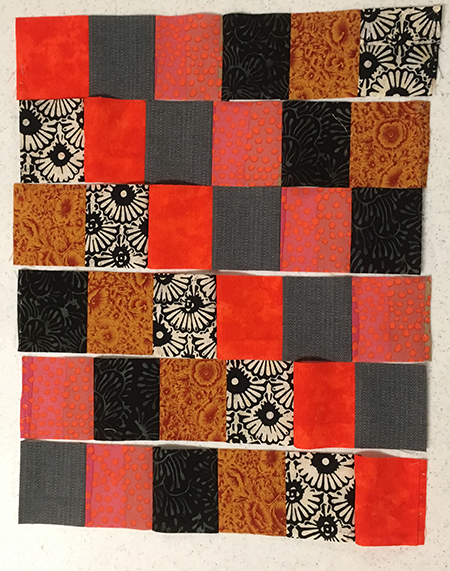 This is 16 little string blocks put together into a small quilt. My fabric recipe was blues, greens and black-and-white prints. Pretty fun! Here’s something more complex. 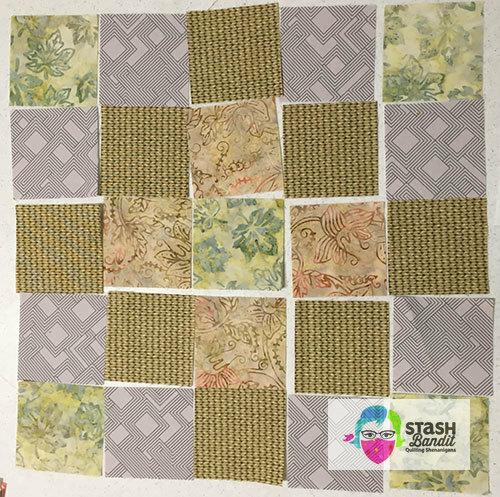 This is Honeycomb by Karen Griska of the Selvage Blog. 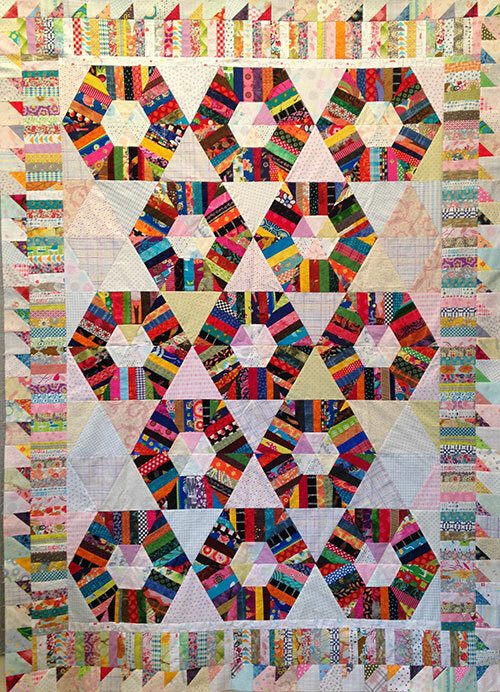 The 60º triangles that make up the hexagons are first string pieced. 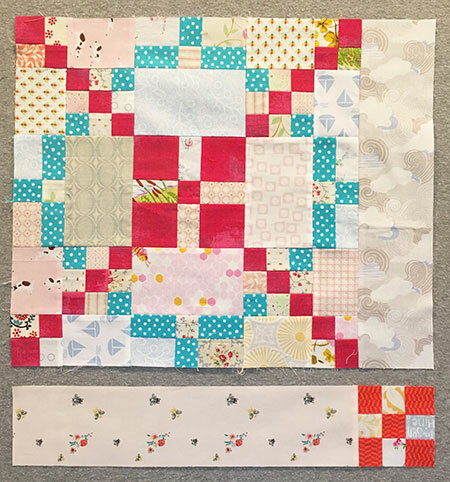 Believe it or not, this is easy sewing, and if you want to make this quilt, I will show you how. You’ll have many more options for what to make. And if you just want to play around, you can do that too. I’ll be there to help you the whole time. We cook and clean up, you create! Here’s a brochure. If you have questions, call Ruth and Gretchen (lovely ladies!!) at Wagner’s Quilts, 308-962-8458. I hope to see you there! I needed to produce a program on short notice for my local quilt group recently, and I’d like to share what I came up with. This is good for those times when your guild’s speaker has to cancel late in the game. 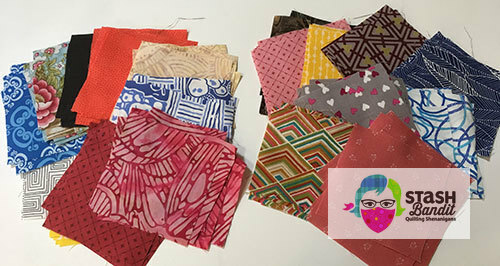 These are 3.5″ patches I played with while making a baby quilt about a year ago. I had a good time arranging and rearranging them until I came up with a combination I liked. I cut up the fabric from a bunch of header cards, also known as waterfall cards, making no effort to coordinate them. It’s better if they do not “match” at all. I cut 3.5″ patches in different values, i.e. lights, mediums and darks. I created a stack of patches for each person. They looked something like those shown above. Not especially appealing, are they? Create contrast between each fabric and its neighbors. In other words, be sure you can see the difference between the fabrics that touch each other. This is a good example: Each fabric contrasts with its neighbors in some way. Color, sometimes! This is the last thing you should consider. It’s the least important! People came up with some terrific combinations. When the fabrics don’t coordinate, you’re forced to look for connections or contrasts apart from color. Take a look by scrolling through some of the blocks. Aren’t they fabulous? The next task was to create a layout with low contrast. In other words, select fabrics that blend into each other so there is very little contrast. Keep in mind that everyone had to work with the patches in her little stack. Some stacks worked better than others. 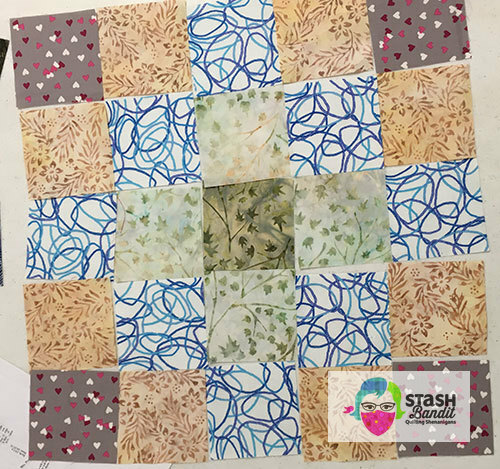 When they finished the 3.5″ exercise, I demonstrated how to make Scrappy Trips blocks, a technique popularized by Bonnie Hunter of quiltville.com. 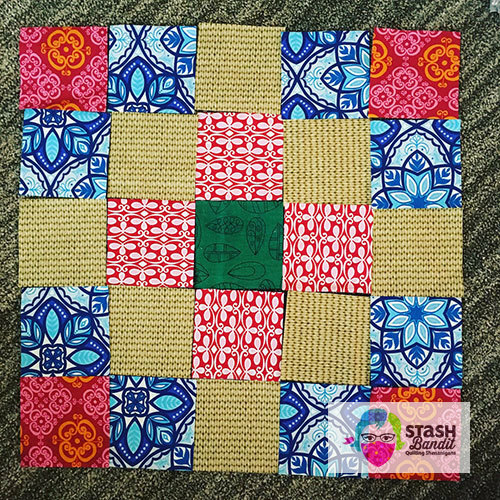 Not only did they learn how to make the blocks, they could analyze how the contrast between the fabrics played out in these new creations. I had the chance to sew the patch rows together a few days later. 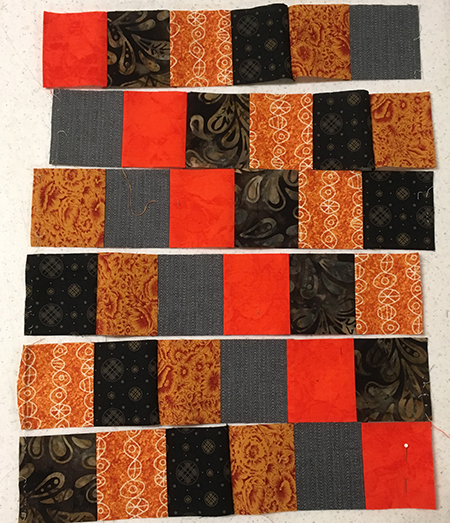 I didn’t intend to start a new quilt, but I really like where this is going. I’ll be adding to it soon. Some three decades ago, Jo Morton was just beginning to teach in our home state of Nebraska. 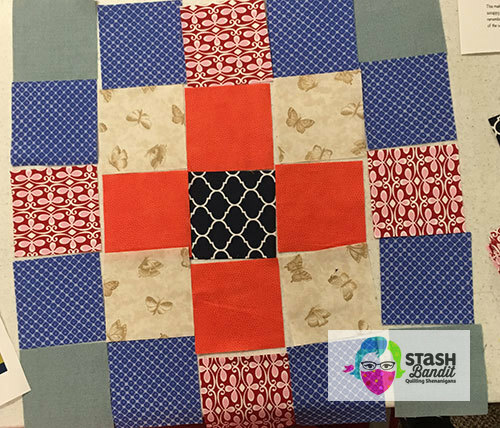 She came to our fledgling guild and taught us to make Log Cabin blocks with strips that finished at 1/2″. 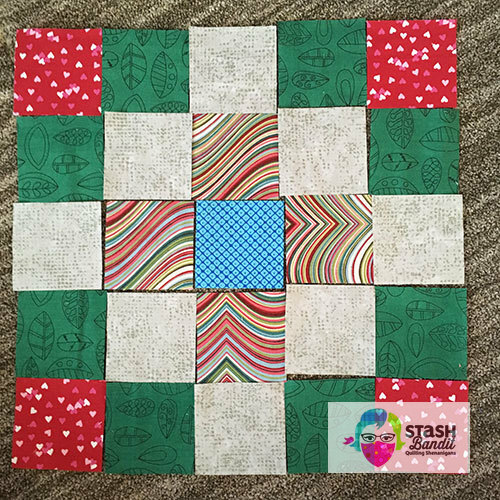 Joining Blocks & Rows: Slick Trick! I finished piecing this long-term project last week. 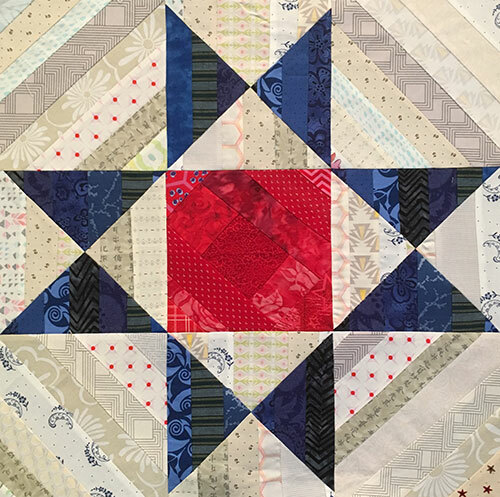 It’s a traditional Burgoyne Surrounded design, but it was reimagined by Lissa Alexander and published in American Patchwork & Quilting. 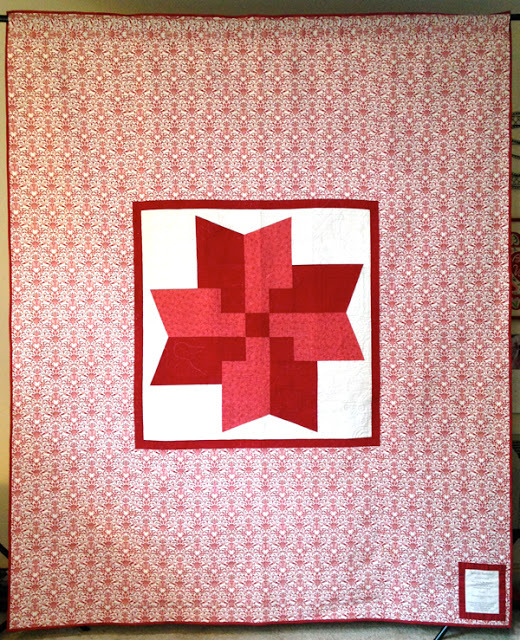 My most recent quilt top is based on Burgoyne Surrounded, a traditional design. I’ve been working on it at retreats for the past couple of years. I’m really pleased with how it turned out, and I used up a lot of light neutral background fabric. The top is 75″ x 90″.